The Linux kernel already includes several drivers for the CAN bus. 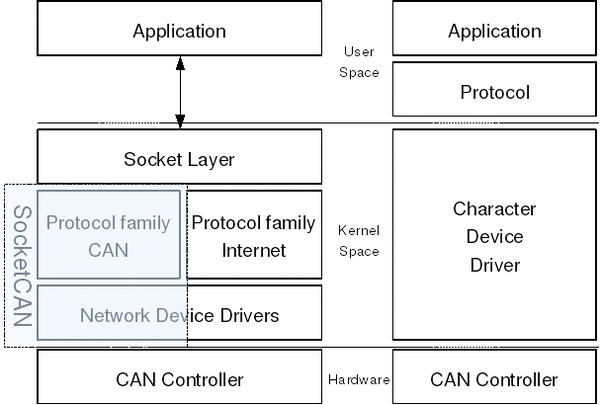 Via a uniform abstraction layer, these drivers can be used as network devices (Figure 5). The CAN subsystem demonstrates that it is not just private kernel hackers and IT companies that work on the Linux Kernel; that code was contributed to the Linux Kernel by Volkswagen Group Electronic Research. Although the Peak System driver used for the USB CAN adapter is contained in the Linux kernel , this is not the case with standard Raspbian. As a result, you have to compile the module yourself, something that is not easy to do. In the standard Raspbian image , a specially optimized kernel (3.6.11+) provided by the Raspberry Pi foundation performs this task, but there are neither appropriate kernel sources in the repository nor the accompanying headers. or you can plug in the CAN adapter and the module will automatically load. However, in the case of a kernel update, you should not forget to recompile and reinstall the CAN driver. The candump tool is used to read from the CAN bus, as shown in Listing 1. On the CAN bus, one data packet consists of an 11-bit-long CAN ID followed by a length indicator with a value between 1 and 8, as well as the data. If necessary, you can even write messages to the CAN bus via cansend. A 3G data stick is used to create the Internet connection for transmitting data from the race car to a laptop. The Raspberry Pi automatically recognizes the stick as a storage device when it is inserted. Under Windows, this makes the installation process easier, but it does not help in Linux. As an alternative, you could use the USB_ModeSwitch  program to make the switch. After the changeover, the stick remains in the new mode; however, it will not be possible to reach the Windows driver, so if you want to use the stick on a Windows computer, you have to copy the driver in advance. In Linux, you can communicate with the UMTS stick via the /dev/ttyUSB0 device. The connection to the Internet is accomplished by means of wvdial. To automate the process, you can enter the lines from Listing 4 into /etc/network/interfaces. The /etc/wvdial.conf file stores the provider-specific configuration. The file has plenty of space for several providers. As a result, it is possible to use country-specific SIM cards for Formula Student competitions and simply change the provider name in /etc/network/interfaces. which in turn contains the IP address in $ip. You can also use a public or self-programmed DynDNS service to accomplish the same thing. DynDNS is a way to modify name server entries dynamically to access computers with a frequently changing IP address. A plugin housing connected to both the CAN bus and the electrical supply protects all of the hardware components from water and dust. During bootup, the Rasp Pi has to load all programs and begin recording data without intervention, because it has no monitor or keyboard when installed in the car. The fourth incarnation of the Pi and More conference brought Raspberry Pi fans together for a day of lectures, workshops, ideas, and experiences. A recent trend shows several data centers are offering professional hosting services for Raspberry Pis. What is this all about?